Oh how very sad. Really sad. I loved The Parasol Protectorate and I hoped against the hope that the next series would be actually even better. While I'm on the opposite side of the fence with this one (I adored it -- a bit over-the-top but so very proper and British and silly), I completely understand your issues. (See! This is why I love books and bloggers! So many different opinions!!) It seemed like this was a bit more of a set-up book, with a smaller plot and larger characters/worldbuilding. We'll see how it plays out in book 2, I guess! Very upsetting. I had not read The Parasol Protectorate, but I feel like I would very much more enjoy that book rather than her upcoming novel. Thank you for the review. I hate when you love one book or series by an author and then the rest just aren't as good and leave you feeling flat. I haven't read any of these books yet but I would like to try the Parasol Protectorate books. Uh-oh! To be honest, Maja, I was kind of afraid this would happen. The plotlessness of the last couple Parasol Protectorate novels left me wary of anything else this author published, and from reader reviews written by readers who WEREN'T familiar with Carriger's previous novels, it seemed like this author was being rather lazy with this. Hmm. I'm sorry to hear you didn't enjoy this one so much. I am going to check out the Parasol series though since I have the first book on my kindle. I hope you find more of what you are looking for in the second book of this series. It seems that this one doesn't sound as good as her other series for you. Especially since humour is an attempted band aid. Never sounds good. I don't think you are the odd one out with this book actually, Maja. Most of the reviews I've read for this have been 3 star reviews, which has dampened my enthusiasm for it a little. I appreciate good entertainment and humour most of the time, but not when there is a lack of decent plot. Sorry this didn't quite live up to your expectations. I'm ready to skip it altogether now. Lovely review! You know, I am in the minority because I was not overly impressed with the first book of her other series, It was just okay for me, so I wasn't overly excited to pick this one up, then I read a bunch of good reviews and I was reconsidering but now I may not after your review, oh who am I kidding I am booked out for four months so it won't happen anytime soon. I'm sorry to hear that! I recently read Soulless and I absolutely loved it, so I am looking forward to continue that series :) I've heard some good things about this book too and I still want to read it, but I will keep this in mind. The fact that there isn't a real plot sounds a bit disappointing. Aw, I'm sorry you didn't love this one as much as everyone else (including me) did, Maja! I really loved the silliness of the plot personally, but I'm not sure if that would have always been the case had I been in a different mood when reading it. 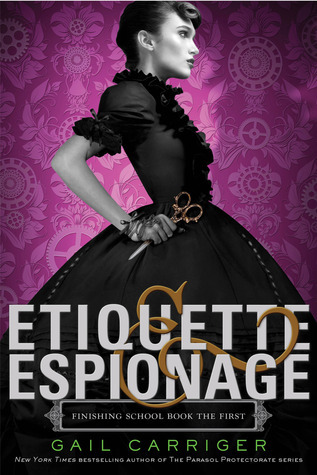 It's actually pretty exciting to hear you say you thought her previous series was funnier and had more substance because Etiquette & Espionage is my first exposure to Gail Carriger's work. So if I loved E&E then I will probably go crazy for her Parasol Protectorate series! Thanks for showcasing your point of review, Maja! I've never read any of Carriger's books so I might like this one a little more than you despite the lack of plot, Maja. The worldbuilding seems solid and I like that there's plenty of humour. Oh no! Sorry this one didn't work out for you. I can't really disagree about the lack of plot, but I guess I enjoyed the atmosphere and the humor so much, I sort of glossed over that. It felt like Lemony Snicket to me; clever and sort of darkly whimsical. But I can absolutely understand not enjoying it, especially if you're used to a higher quality of story set in the same fictional universe. This makes me all the more excited to get into Soulless! And I'm very glad to hear that I'll be seeing Vieve again. :-) Wonderful review, and thanks for your honesty! I only read Soulless and that was a long time ago so I missed any similarities. I mentioned in my review that it almost fell into whimsy overload for me at some points but I enjoyed it for the most part. I'm reading this right now. I am a HUGE Carriger fan. I feel like this book started out strong, but now it's kind of leveled off. I'm about halfway through it, so we'll see what I think at the end. Thank you for your honest review!